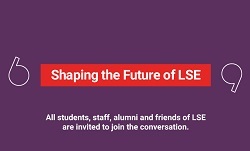 If you haven’t yet shared your views on the future of LSE, you can do so until Friday, July 6. The world is changing, and LSE needs to understand its role and evolve to respond to new challenges. All students, staff, alumni and friends of LSE are invited to respond. You will be asked to create a profile to respond. Follow this link for more informaton: https://lsefuture.lse.ac.uk.